For my business cards I wanted to find a way to show my graphic design and illustration skills combined to one creation. And it turned out, that a hand lettering illustration is the perfect solution for that. 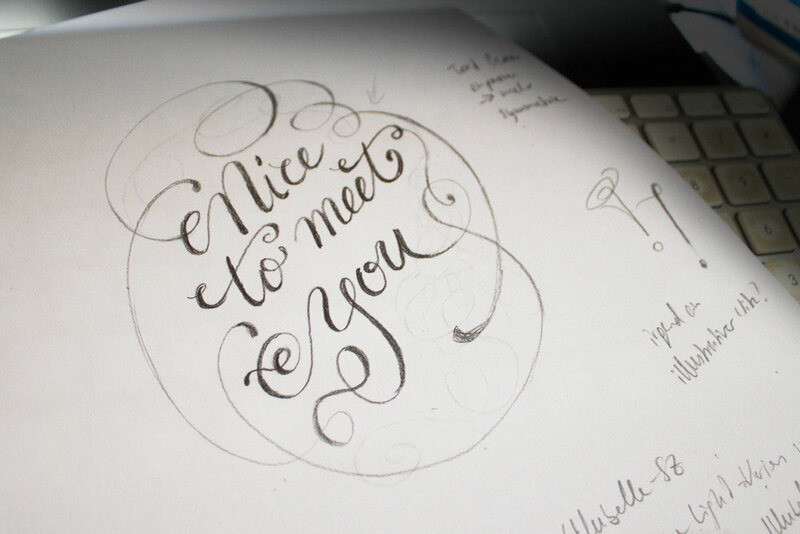 This is the creation process of my hand lettering artwork „Nice to meet you!“. 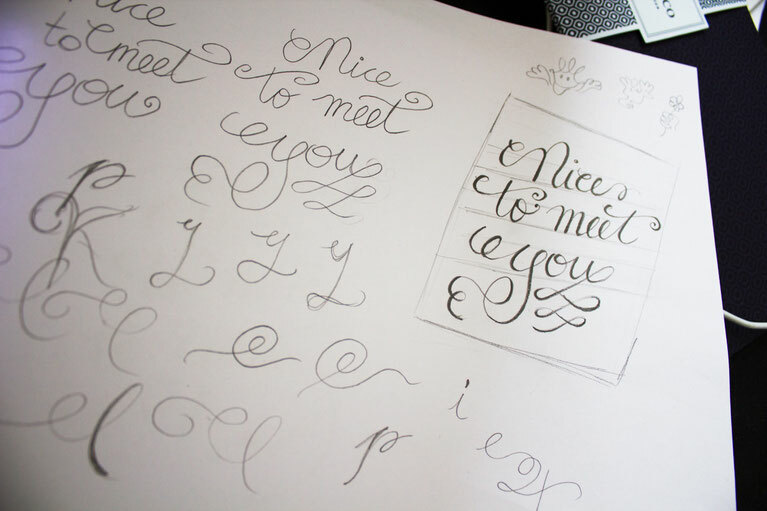 First I did some hand lettering sketches and tried several versions of letters and flourish. In the next step I added some illustrations. 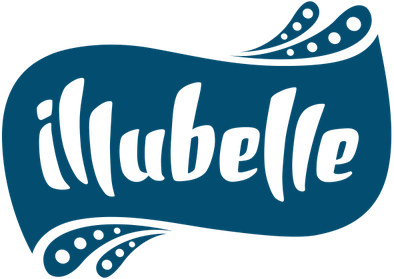 I knew that I wanted it the same style as my hand lettering, but at first I didn’t think about combining them with each other. 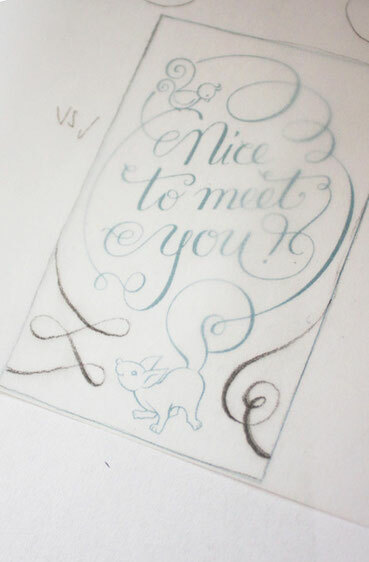 I was thinking about some funny garden motives – I took this approach from a former concept for my business cards. 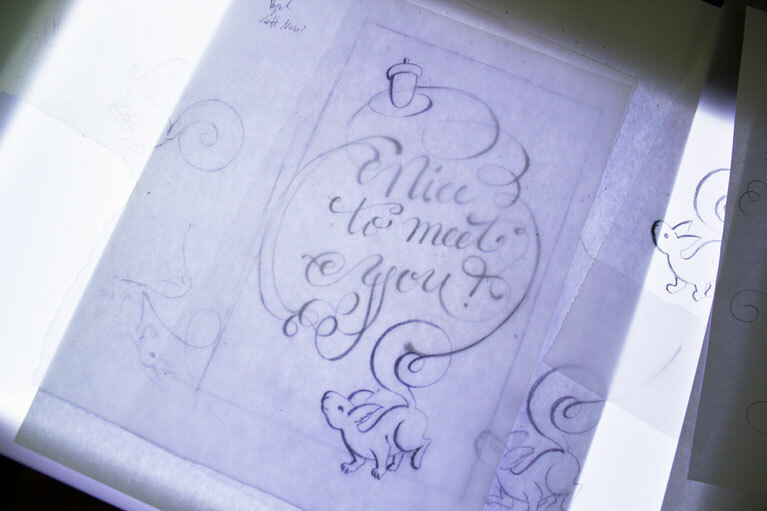 But when I created a snail out of a flourish ending, I had the idea to let the illustration being part of the hand lettering and developed this idea further. 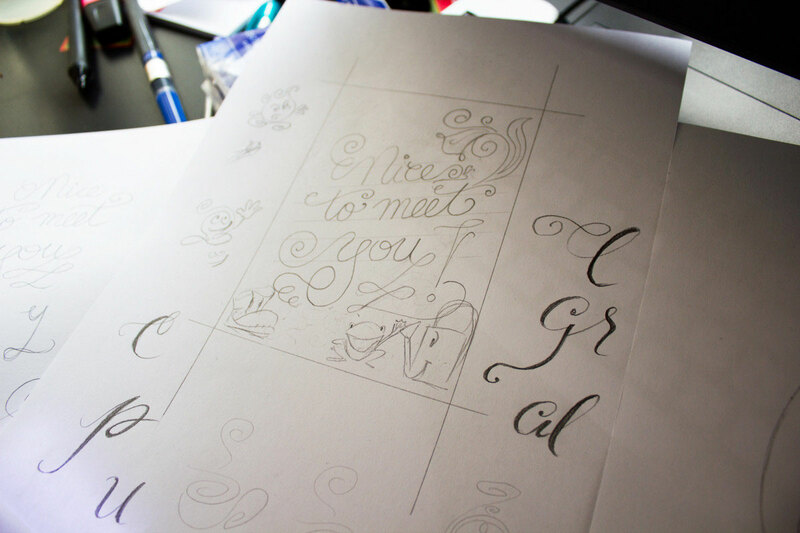 Before I went on with the illustration part, I finished the hand lettering in some steps of tracing. At this time I forgot the exclamation mark, but I added it later. 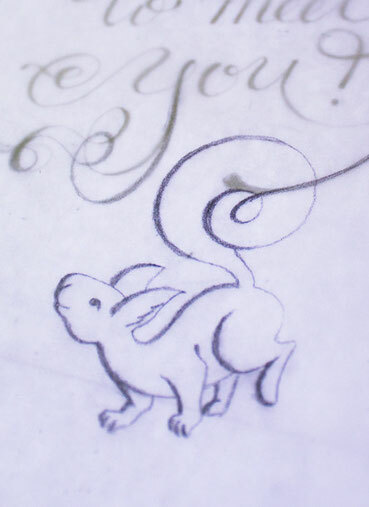 I thought that a big flourish could fit well with the tail of a squirrel. As a counterbalance I wanted to add a little illustration in the opposite corner. An acorn would be quite nice for a squirrel. But then I wasn’t happy with the acorn, because it reminded me too much of the movie „Ice age“ with the crazy squirrel hunting the nut. An important thought was, to combine not only the formal shapes, but also the content. 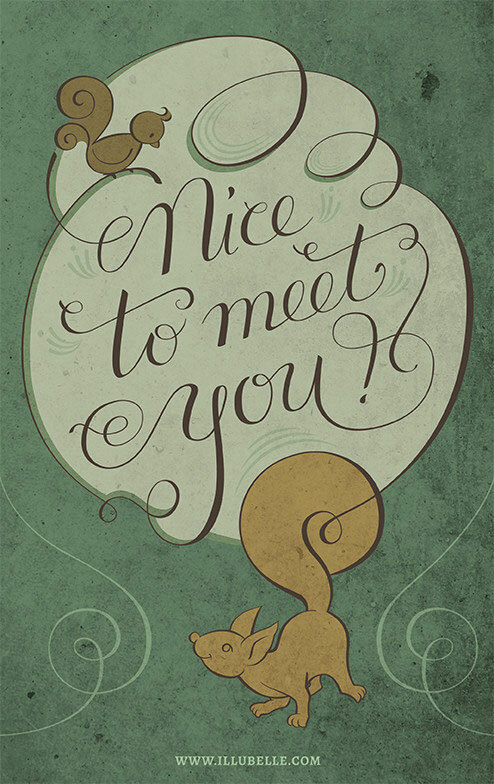 There is a little creature looking up to the words „Nice to meet you!“ – so there should be a recipient of this message on the other side. I decided for a bird sitting on a branch! 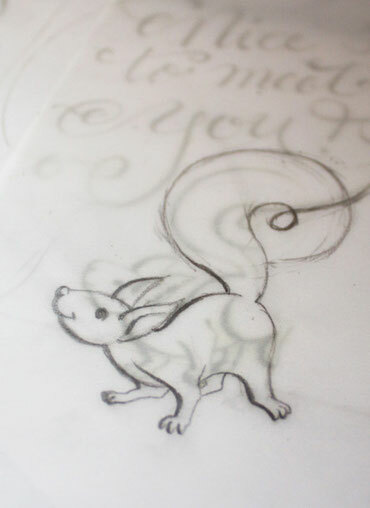 When I showed the artwork to my partner, he noted, that the squirrel looked like some kind of dragon or gargoyle. 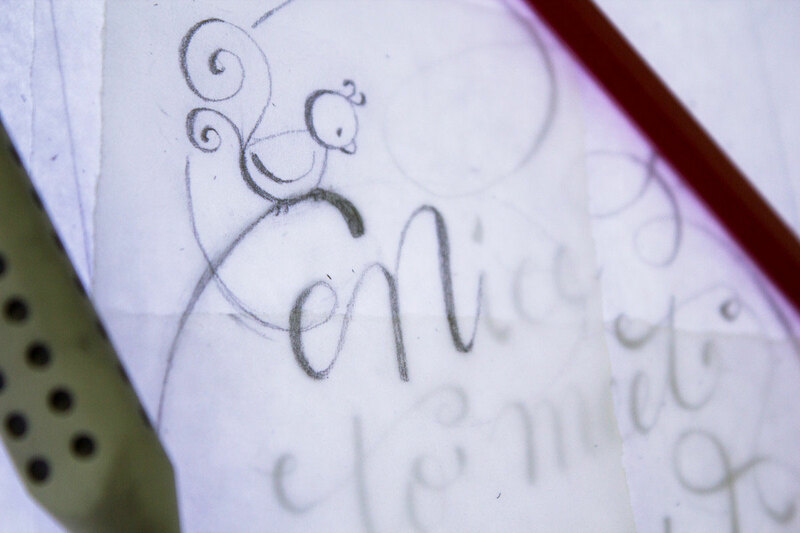 First I was angry, as always when he criticizes my work, but soon I saw that he was right. And so I studied some more squirrel photographs, did some naturalistic sketches and created a new squirrel – and with that one I’m really happy! It looks so much nicer – and now the „dragon“ looks even more like a dragon. 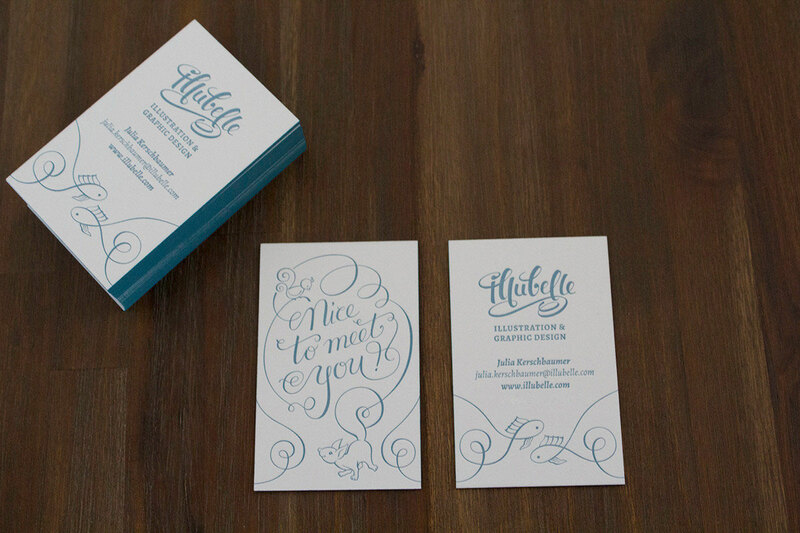 At next I had to find a way to conform both sides of my business cards. 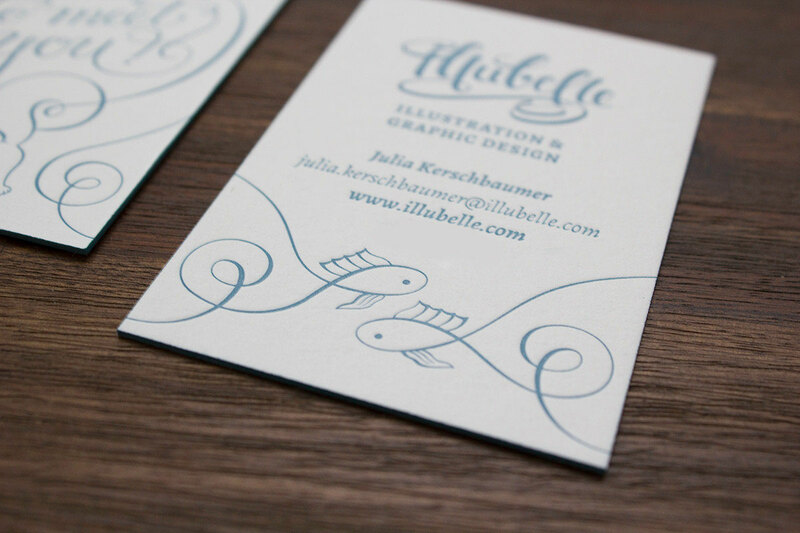 After I had vectorized the hand lettering artwork and designed the back side of the business card with my logo and contact, I thought that the contact part looked a little naked without an illustration. 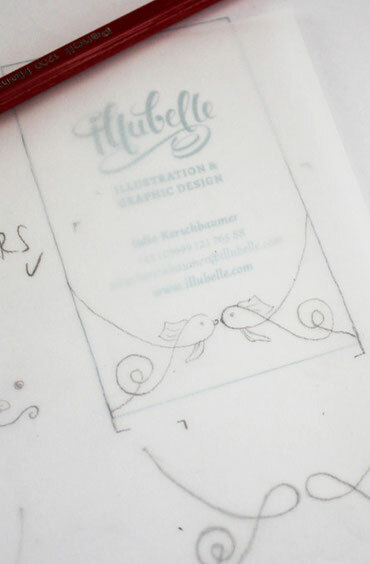 So I tried some versions to connect both sides with a flourish illustration – in the end there were two sweet little kissing fishes. Later, when I vectorized them, I thought that it looks better to let them swim parallel in the opposite direction, to break this static symmetry. So, my business cards are ready – and I really like them! 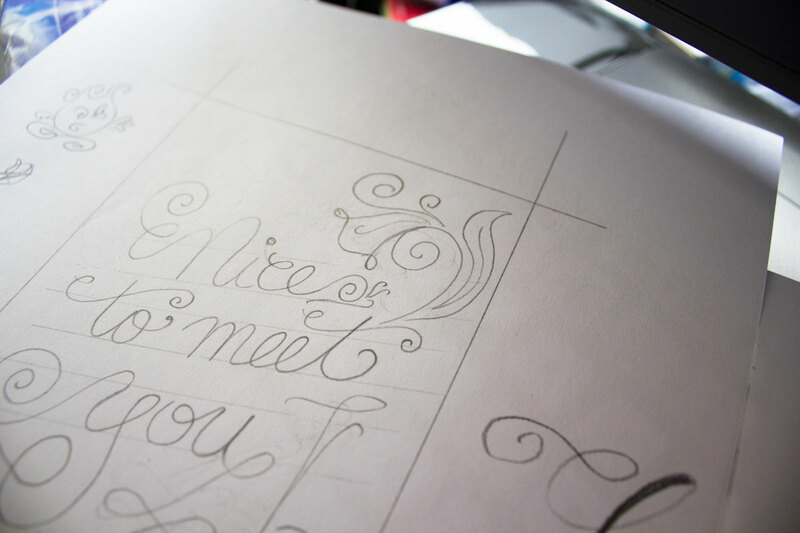 Later I colored the „Nice to meet you“ artwork, to see how this would work for a picture. And it turned out, that this style would be perfect for a book cover – a lot of publishers at the book fair Frankfurt were interested in this illustration!